Mechanical Accessories — Ezy-Glide Inc. The Ezy-Tab is designed to counter the torque pressure on the wheel and will reduce or even eliminate steering torque. It mounts on the skeg of the motor below the prop on the gearcase. Easy to Install. Made of cast aluminum with stainless screws. The Torque Tamer is designed to assist the operator by reducing steering torque feedback, especially with 4-Stroke engines. The Torque Tamer is designed for Ezy-Glide Steering Systems only. This part will fit most Mercury and Yamaha engines. 5” long from base to bolt. This kit is to supply through tube engine connection. These are primarily for engines that do not have the remote steering tube/tilt tube built onto the engine. 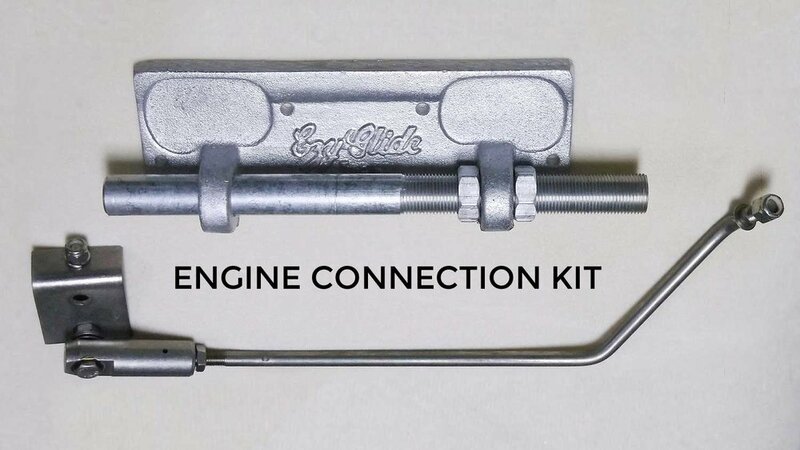 This kit supplies the transom plate, threaded tube and link-arm connection to the engine. These kits are made only for cable entry from the port side of the tube. A brand-new product which has already produced great results for lubricating installedEzy-Stik systems. This product is used to ease steering for the operator when steering has become stiff from problems other than defective steering. Comes with a drill template for the Ezy-Stik II 840 system to allow for drilling a small hole through the existing mount surface and housing to the inside of the helm. After drilling, insert syringe into hole of housing and apply 1 oz. into housing. Ezy-Shot Syringe holds 2 oz.—enough for 2applications. This aluminum mount pad is for port mount installation adjacent to the operator’s seat. The Rigger’s Pal Mount Pad with its compact and space-saving design is for mounting the helm of the stick steering system as shown. DIMENSIONS: 12” HIGH, 6” DEEP, 10” WIDE. Adjustable aluminum mount pad for installation adjacent to theoperator’s seat. The Adjustable Mount Bracket uses the same compact and space-saving design as the Rigger’s Pal for mounting the helm of the stick steering system. Adjusts by 1” positions both in depth and height for greater flexibility of installation and boat design. 7 height positions and 5 depth positions. DIMENSIONS: 10” WIDE; ADJUSTS FROM 14” TO 18¼” HIGH AND ADJUSTS FROM 8¾” TO 11⅞” DEEP. The Lever Latch has two functions. First, the latch can be flipped down over the lever of the Ezy-Stik lever as shown. This works well to hold the engine in straight-ahead position. Second, this same position will allow trolling in a straight line.